Pay for Performance (P4P), the burgeoning movement in the healthcare industry to align financial incentives with improved results, is touted as a means of improving healthcare quality without increasing costs. Health plans are now devising metrics for tying millions of dollars in physician bonus incentives to healthcare quality outcomes. In this special report, "Pay for Performance: Raising the Bar on Quality, Efficiency and Results," based on two recent audio conferences, a panel of experts shared their experiences: healthcare consultants analyzed the results of national studies on the reach of P4P programs among U.S.-based health plans and sketched out a timeline for future developments, while three organizations described their ongoing efforts to build cohesive P4P programs. You'll hear from Geoffrey B. Baker, President, Med-Vantage, Inc.; Dr. Nicholas Bonvicino, Senior Medical Director, Clinical Network Management, Horizon-Blue Cross Blue Shield of New Jersey; Paul Keckley, Executive Director, The Center for Evidence-Based Medicine at Vanderbilt University Medical Center; Dr. Milton Schwarz, Regional Medical Director, Aetna US Healthcare; and Mark Xistris, Director of Provider Relations & Health Information, The Alliance on theories, application and results of pay for performance programs. 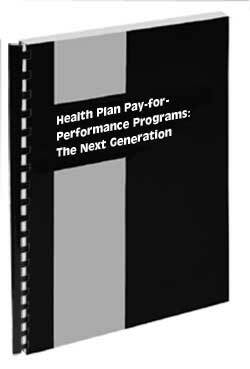 This 64-page report is based on the June 10, 2004 audio conference "Pay for Performance: Improving Clinical and Financial Outcomes" and the September 8, 2004 audio conference "Pay for Performance Measures: Lessons from the Early Adopters" during which Baker, Bonvicino, Keckley, Schwarz and Xistris described the P4P landscape today, the impact of evidence-based medicine on P4P, an employer coalition’s experience, how Horizon Blue Cross Blue Shield of New Jersey has revamped their quality improvement program and the fundamentals, metrics and payment details of the Aetna P4P program in California. Click here to order both and save today!